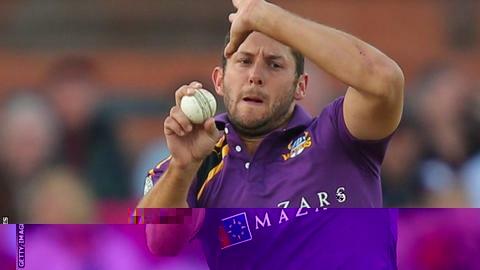 Yorkshire pace bowler Tim Bresnan will join Hobart Hurricanes for the second half of the Australian Big Bash Twenty20 tournament. Bresnan will replace Darren Sammy, who must leave Hobart in mid-December to take part in the West Indies' pre-World Cup training camp. The 29-year-old will join England's Alex Hales at the Hurricanes. "I have been lucky enough to watch the Big Bash over the last few years and I think it is great," Bresnan said. "It's a massive competition and the format works really well and is something that the rest of the world can take on." Bresnan, who has played 23 Tests and last represented England in March, will arrive in Australia in late December. He will be available for the Hurricanes' match against the Melbourne Renegades at Blundstone Arena on 7 January. Meanwhile, Yorkshire have announced plans to redevelop Bradford Park Avenue cricket ground in a deal with the England and Wales Cricket Board, Yorkshire Cricket Board and Bradford Council. "Fundamentally, this is about community use at an inner-city ground," said Yorkshire chief-executive Mark Arthur. "If up to standard, the odd first-class match could go there, particularly in 2019 when Leeds hosts a one-day international, an Ashes Test and probably four World Cup games."